Tabula Rasa is a book that starts off with a bang, and keeps going from there. This book will keep you on the edge of the seat, and your fingers flying through the pages. Having undergone multiple surgeries to erase her memories, Sarah has almost no recollection of her past life. When her last surgery, the one that will clear her slate forever, gets interrupted, and the hospital she is in is overrun by a group of elite soldiers who are intent on killing her, Sarah’s new life may come to an end before it even begins. Sarah was a really interesting main character. Having little to no recollection of the things that happened in her past should have impaired her, but it didn’t. She was somehow able to figure out exactly what she needed to do to survive. She was kind of a hard character to connect with, as at times she really came off as indifferent, which I know was a side-effect of the procedures that she had. But she really did start to grown on me throughout the story, and by the end of the book, she had totally won me over. I kind of have a thing for nerdy computer guys in novels, maybe I’m a bit biased because I am married to one, so I thought Thomas was a really great character. The way he could work a computer was very impressive, and he had some super awesome skills to work with. Together, he and Sarah make a really great pair, and the growing relationship between the two was super adorable. This book is described as The Bourne Identity meets Divergent, and having read the book, I can definitely see the comparison. This book would also make a great movie. The storyline was highly addictive and it kept me flying through the pages. The book is packed with action and suspense that left me on the edge of my seat throughout almost the whole book. 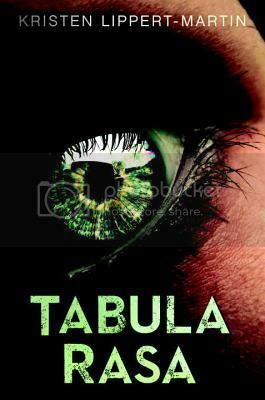 Overall; I found Tabula Rasa to be a very entertaining read. Kristen Lippert-Martin definitely has a hit on her hands with her debut novel, and I’m really looking forward to reading more by her in the future.